A grand opening for an exhibition of photos that Elaine Straub shot of the Great Flood of 1982 was held Sunday in the Jack Mason Museum of West Marin History in Inverness. The exhibit commemorates the 30th anniversary of the devastating storm of Jan. 4, 1982, that destroyed homes, drowned cattle, and caused mudslides that blocked roads. Some of the worst damage was in the Inverness-Point Reyes Station area. Many neighbors rallied to help each other deal with the crisis, and this was widely recognized as the main good to result from the storm. For last week’s posting, former Inverness resident John Robbins described how he and his family barely escaped when rain-swollen Redwood Creek swept their house down hill and across Sir Francis Drake Boulevard to the edge of Tomales Bay. Elaine Straub at the exhibition of her historic photos. Elaine and her husband Dwight are both retired doctors and have lived in West Marin for 40 years. The storm left remnants of homes and uprooted trees along the south shore of Papermill Creek near its juncture with Tomales Bay. Black Mountain is in the background. Creek waters poured onto Mount Vision Road in Inverness and left Ramon Cadiz’s truck on top of uprooted trees. When the truck was finally freed, Ramon found it was still in working order, as was a flashlight left in the vehicle. Inverness residents walk past one of the mudslides that closed Sir Francis Drake Boulevard. Fording the flood on Laurel Avenue. After landslides covered parts of Sir Francis Drake Boulevard in the Inverness-Inverness Park area, traffic was blocked until the National Guard showed up and cleared the roadway. 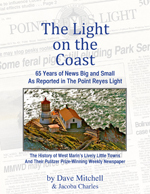 Mudslides left the Inverness Firehouse “ankle-deep in slime, broken timbers, and glass everywhere,” the late historian Jack Mason wrote in the final issue of the Point Reyes Historian. Firefighters relocated their headquarters to Inverness School just before their building became unusable. At the firehouse, disaster workers received pastries delivered from Inverness Park by canoe, and the Red Cross provided food, water, medicine, stress counseling and even haircuts. The exhibit will remain up until the end of March and may be visited any time the Inverness Library is open (Monday 3 to 6 p.m.), Tuesday and Wednesday (10 a.m. to 1 p.m. and 2 to 5 p.m.), Thursday (closed), Friday (3 to 6 p.m.), Saturday (10 a.m. to 1 p.m.), Sunday (closed). Sparsely Sage and Timely is powered by	WordPress 4.9.10 and delivered to you in 0.466 seconds using 54 queries.